Learning to control your emotions, the rewards are priceless. When we let our emotions control us we weaken our position in a situation. We have to be able to look at things from a third persons perspective meaning we should be able to take ourselves out of the equation and look from the outside in. When we do not allow our emotions to control us we are able respond to situations based on the facts alone. Most of the time arguments and misunderstandings occur because we are too emotional, we allow our emotions to get the better of us and respond from a place which is clouded by all these raw emotions. Let’s take a work situation for example. Your manager tells you they are making some changes and you will have to take on additional responsibilities although at present you barely have time to do your current work load. The emotional person does not think, responding in an annoyance state can only do the situation harm right? Instead you should take your feelings out of the equation and allow yourself to think about the bigger picture. You may not realise it but it could be the best thing to ever happen to you in the long run. We are so ego driven, thinking the world revolves around us. Once we understand that in the grand scheme of the universe we are a mere speck, the way we behave and react will change. Controlling my emotions have been one of the things I have really been trying to work on. A point came where I realised my rash unthought responses was doing me no good. Sometimes we take things too personal, most of us have spent our lives inflating our egos to a point we think we are these amazing individuals who should get whatever we want when we want it. We struggle to see past self. This is not how the world works. I can not say I have my emotions totally under control yet, I’ve not yet reach the point I’m aspiring to reach with it but I’ve made a lot of improvements. I can honestly say it’s a great empowering feeling. The first thing I do is I take extra care to listen. When people talk to you are you actually listening? There’s a big difference between hearing and listening. Are you truly taking in, absorbing what this person is saying. When someone is talking to you be quiet, do not interrupt them by responding to every other comment they make. Take time to let them speak so you can get the full picture. You can even ask them have you finished to be sure. The only time I feel it’s important to interrupt is to get clarification. It’s ok to say things like; what do you mean? Such as? Give me an example, I don’t understand. If you’re someone like me who can drift off, meaning you’re now only hearing not listening, don’t be ashamed to say sorry can you repeat that please. The more practice you get at listening the easier it will get to stay tuned in. Before responding internally ask yourself “how do I feel about what’s just been said” we can not respond correctly if we are experiencing a raw negative emotion. If your answer is anything negative such as “angry” accept, understand it then make a conscious decision to change it. Negative emotions left unchecked grow and lead to negative responses. Take yourself out of the situation and deal with the facts only. Silence your ego. One of the last things I do is I take a minute to actually think. Thinking positively is the key, our thought process must be constructive. If you need more time to think and the situation permits it, do not be afraid to ask for it. Look at it like this, depending on the situation your response has the potential to change your life. That’s a few of the things I do to help me control my emotions. As time goes on the things you do will not be such a conscious effort. The more you practice and repeat your methods the easier it will get, it will become imprinted into you subconscious system. Just as you breathe you will control your emotions. Your ability to control your emotions or not ultimately affect how you are perceived by others. Why let a bad response taint your image? What image are you currently portraying? Weak, shy, rude, scary, professional. This lack of awareness is what prevents so many of us from reaching our full potential in life, it prevents longevity in our relationships. Not controlling our emotions can be our downfall. Become aware. Become conscious of your emotions and then you can learn to control them to your benefit. < Previous What’s a Poem? 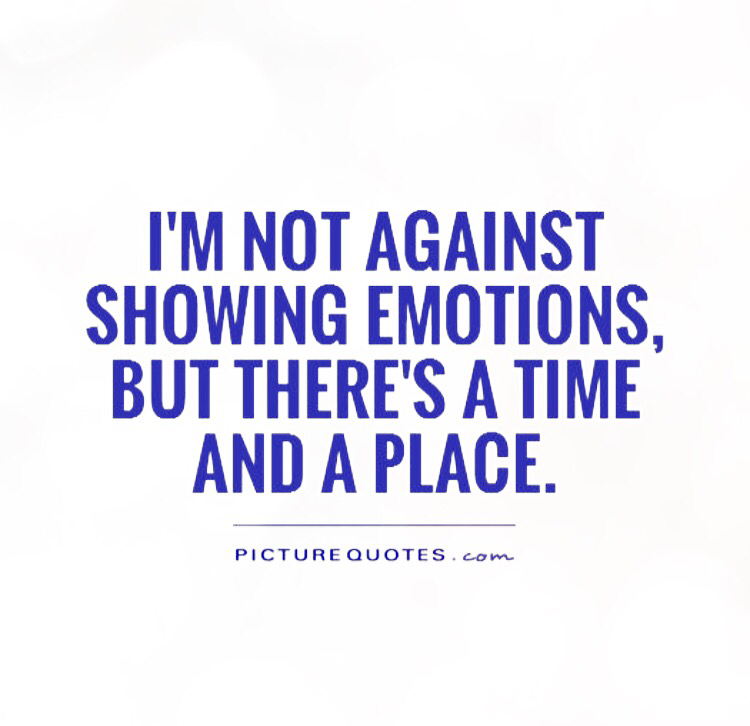 I agree with you, am not afraid of showing emotions, but there is a place. I have learnt this the hard way. Who told you to read me😆I’ve just became aware that I struggle with this because I tend to be a perfectionist. A perfectionist gets validation from others acknowledgments and praises. I’ve burdened and burned myself out so many times, by putting energy into perfecting the imperfect. When I’m met with anything less than praise and admiration, it feels like a personal attack. What helps me is focusing on my body language. Is my legs, ankle or arms crossed. Has my body tensed up, am I fidgeting. Checking in with my body let’s me know if the message is going to be received. If I feel these things I know not to respond, and will have to investigate why. Being defensive is not negative to me anymore because it makes me aware that something doesn’t feel right. Now, the catch is the thing that doesn’t feel right has nothing to do with the current situation, but an unchecked trauma. It’s not about denying what you feel, it’s the acknowledgment of it, that should be explored in a safe space…which is not in a public sphere. 😃Exactly. Becoming aware is definitely the first step, it’s when we’re in denial that’s the problem. Usually we run from our emotions but when we acknowledge them we can start to deal with them in the right way and not allow them to control us to the point we take it out on other people..